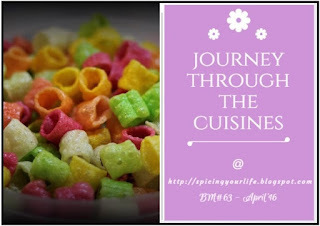 In our Journey through the Cuisines ,with the alphabet H , I had the option of making either Halwa or Halwe ja Samosa. When Sindhis talk of Halwa they refer to the Karachi Halwa. The Sooji ka Halwa is Seero in Sindhi. The Karachi Halwa has lot of significance and it is very popular in Sindhi families.Its customary to give at least one box of this Halwa on the engagement of a girl. Of course with time the number of boxes has increased as this is then distributed among close family and friends.So much so for the Halwa, what about the Halwe ja Samosa ? These are made just like our savoury samosas, but the crust is salt free. The halwa is chopped into small pieces and the stuffing is ready. On deep frying the Halwa melts a little and becomes gooey. 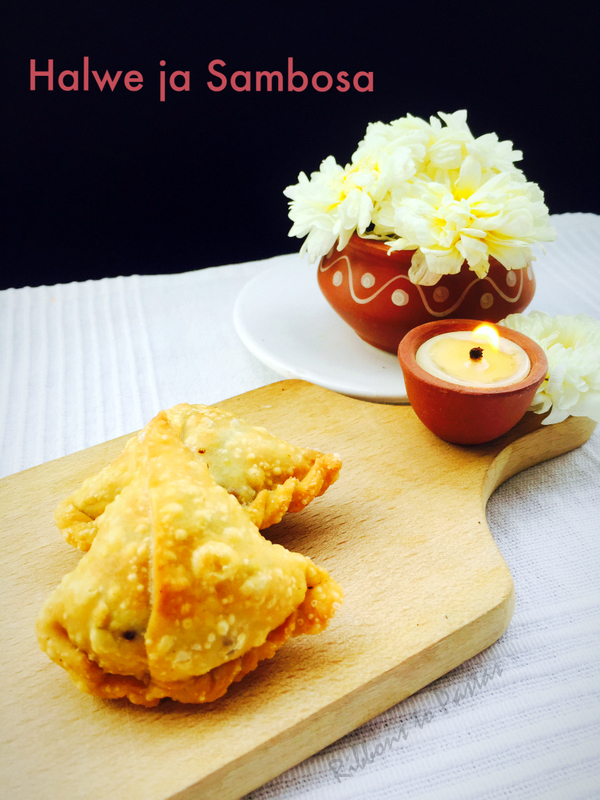 These samosas are made on Holi festival and are also called Mitha Sambosas. There might be hundreds of Sindhi sweet shops all over India but when it comes to Halwa it is only from Tharu of Mumbai that the Sindhi’s buy from. Add warm ghee to the sifted flour. Rub with hands to resemble bread crumbs. Adding water make a firm dough. Cover with a muslin cloth and leave for 20-30 minutes. Pinch out even sized balls. Roll a ball to a 6 ” disc. Cut the disc from the center. Apply little water on the edge of the sliced disc. Join the two edges, thus forming a cone. Place the cone between your thumb and forefinger. 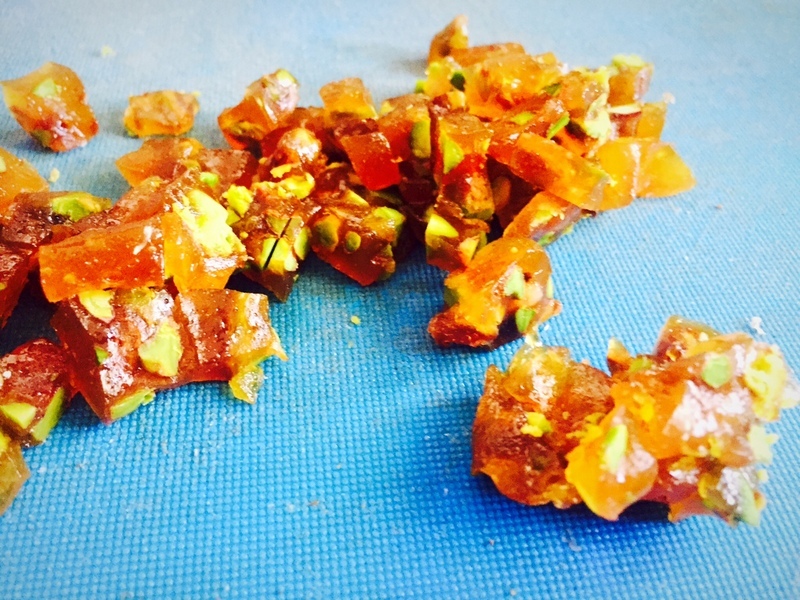 Place a few chopped pieces of the Halwa. Apply water with finger tips to seal the cone. You could pinch and make designs while sealing. Deep fry the samosas in ghee, making sure they cook on medium flame. Fry till nice and golden. The Halwa stuffing melts after frying. 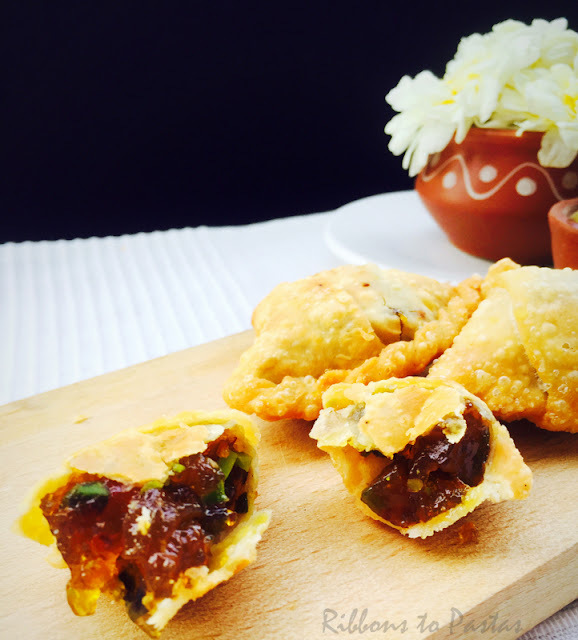 OMG Vaishali, halwa stuffed pastries — now that is absolutely delicious. I'm drooling over here. That Karachi halwa a is one of my favorite sweet dishes and this dish sounds absolutely amazing. I didn'the know there was a sweet samosa version. OMG that's one awesome samosa Vaishali…gosh you guys really feast on sweets..hahahah..such a sinful one…and the halwa looks so fantastic..we get this sort of halwa in kerala…or what we call as the maida halwa..that's firm..good one.. The halwa inside kind of looks like precious gems! Tea time here and how I would like to have one of those now!! I should not have seen this early in the morning. Now I am craving for halwa samosa for breakfast. How delicious they look. Thanks for introduicing us to all the amazing Sindhi recipes. Halwa stuffed samosa ,omg ,you are killing me with all these sinful treats.Looks too temping. 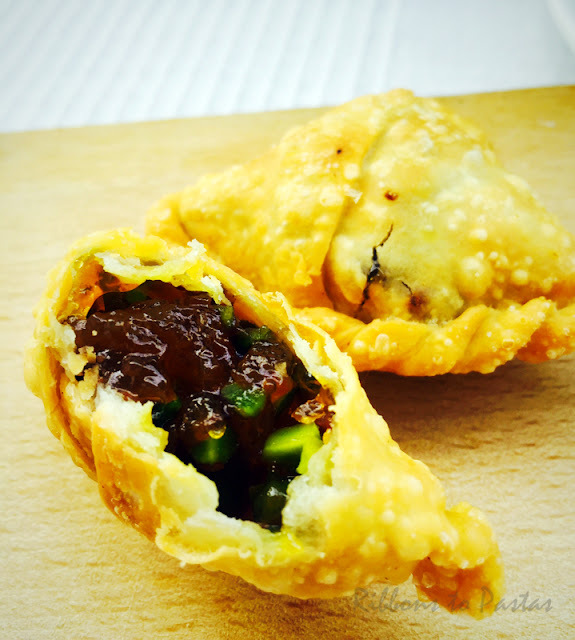 These samosas look gorgeous Vaishali. Yum..
Am ready to munch some anytime, dangerously addictive halwe ja sambosa. super awesome samosa. Goodness of sweetness and the savory from the outer covering and the crunchiness.. wow. Can't ask for anything better. That is a very sinful dessert. Looks fantastic.